Easy to transport, easy to push. The Catalyst 4 & 4C are the lightest most durable and energy efficient K0004 folders on the market today. Catalyst 4 & 4C both take advantage of all of the "Catalyst Difference" design features to allow you to fit, adjust and ride with confidence. A defining characteristic of each chair is its axle plate which we will highlight below. The Catalyst 4 series axle is mounted 1 ½" forward to traditional axle positions. This small change can improve efficiency significantly. The simple axle plate design offers vertical adjustments of the axle in five positions. It can also be reversed to gain greater rearward stability. Catalyst 4 & 4C offer the option of a swing away front end featuring our patented footrests or 70° or 80° fixed frames. The swing away hangers come in 4 bends (60°, 70°, 80° & 90°) are light and easy to use and so strong we offer a lifetime warranty. Ki Mobility proudly offers the ultra-sleek and lightweight X-Coretm mags. 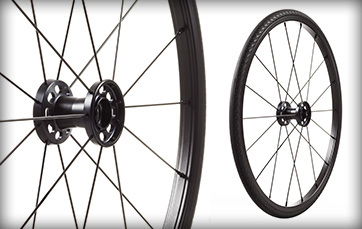 These wheels have far greater stiffness and rigidity than conventional mags while keeping the weight to only 1 lb. more than spokes. Now available in 20", 22" and 24". 16”x16” Frame, 5”x1” Poly Casters, Height Adjustable T-Arm Receivers. Footrest and Rear Wheels removed.